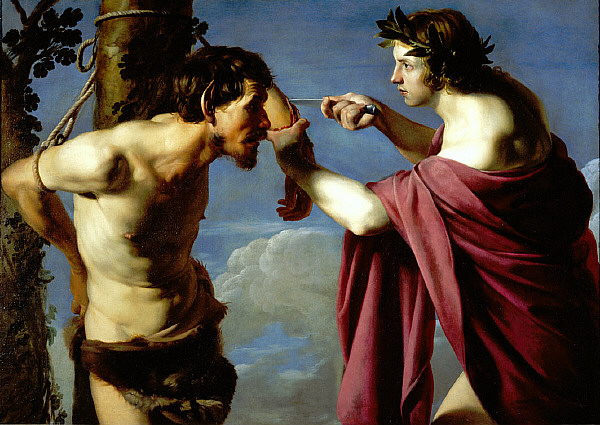 This is my favorite political painting: Apollo and Marsyas by Bartolomeo Manfredi, an image from the class wars, 1620 as well as today. This spoilt brat from the one percent, slightly flabby because of all the drugs and good times, but powerful and so damn worldly wise and dangerous. He doesn’t blink an eyelid while methodically skinning us alive, he’s rather curious as to how we’ll take it. What can we do? We stare inwards in a resigned sort of dignity facing the question: at what point did it go so completely wrong? We didn’t have a chance ever for a second, did we? A painting so to the point, it’s still the same confrontation and the same outcome 400 years later . . .
I’m not being clever, by the way, this is what it really is. Just try a quick search and you’ll reassuringly find that the Marsyas myth already played a symbolical role in the class struggles of late Roman antiquity and figured in the political stage plays of the time, and that later it was discussed in that light by historians such as Giambattista Vico in his New Science from 1725. Apollo stood and stands for the patricians, Marsyas the plebeians. Class confrontations are nothing unusual in the art of the time, even though they’re mostly interpreted more mildly. 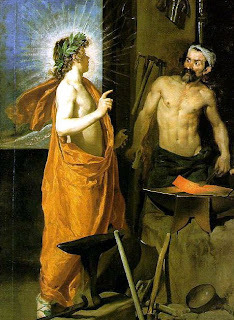 You will know Velázquez’ Apollo at the Forge of Vulcan from the same period (around 1630, see here a detail). It’s similarly obvious about the artist’s sympathies with down to earth natural dignity rather than the fop satirized by a halo of self-importance. Still the image is much more complicated and much less political. It is serious about telling the myth (the details of which don’t interest us here), and more than about class conflict itself it seems about a contrast between fancy decadent high art (Apollo the god of music and poetry) vs. the mythical blacksmith as an honest craftsman. So there is satire, but not the brutal urgency of the Manfredi. But then nothing I know really compares to that. I am thinking about favorite political art because I have just read T.J. Clark’s fantastic book Image of the People about Courbet as a political painter in the aftermath of the 1848 revolution. What makes the book so great is that it allows no easy connections between an artist’s interest in the people, his realist efforts to catch a truth about them, and the resultant political impact of the painting. Clark isn’t the only one to reject these easy connections, but I don’t think I’ve ever encountered such a thorough dividing up of all the elements at play: what the painter knew, what he wished but failed to express, what the painting knew (more than the painter, of course), what it accidently communicated at its time and now reveals to us, and how the mindframe of the contemporary viewer would allow only certain parts of the message to be painted in the first place. In the most spectacular chapter, a handful of the stone cold classics of realism slowly travel from the countryside to Paris over several exhibitions after the Salon of 1850 had been postponed. They were well received but nothing special in Ornans, where they’d been produced, immensely successful in Besançon, purposefully ignored in Dijon, gaining ever more political heft until in Paris they became a statement, because the suffering peasant population there was a headline not a fact of life and as such had more impact. And why did the country personage look so bourgeois anyway, it was insidious. Alcohol might explain it. 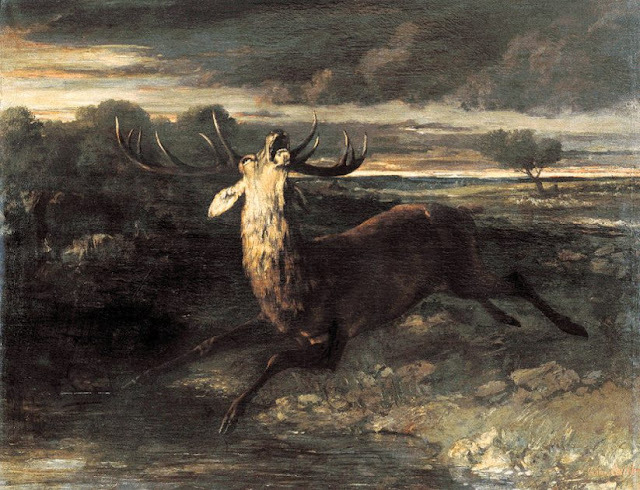 The stag fleeing from the hunt, throwing a pained look skywards, seemingly checking the weather . . . but then I remember the contemporary review of the realist masterpiece above, and isn’t this also “a ballad in painting, where there is more to laugh than to make you cry?” More responsible than drink might be the virtues of academic painting, like catching a moment most pregnant in narrative which would ennoble a nature piece to almost the status of a history painting. The same aspirations could also explain the somewhat too human expression of the stag (which reminds us of Landseer’s lifesaving dog, the forebear of the Disney comic which has had two appearances already on this blog, so enough of that). This is one of the most interpreted images ever. 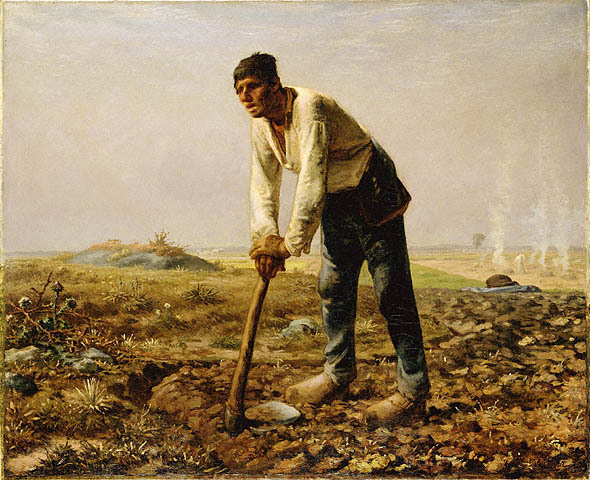 Courbet himself said the moral was that in this job you started carrying huge loads like the young guy and ended up bent like the old one. The men are rendered anonymous, one averted and one below the rim of his hat, which is usually read as a meaningless job killing the individual. So this is realism, a word that today seems to mean an artistic approach, but sometimes it will mean no more than a thematic engagement with some kind of low life. Because the method is rather Victorian in its close realism of detail and overall poetry, and doesn’t the picture look almost related to something like, say, a William Dyce? (Partly because the coloring is somewhat unlike Courbet—the work was destroyed in 1945 so the photo looks almost handcolored.) 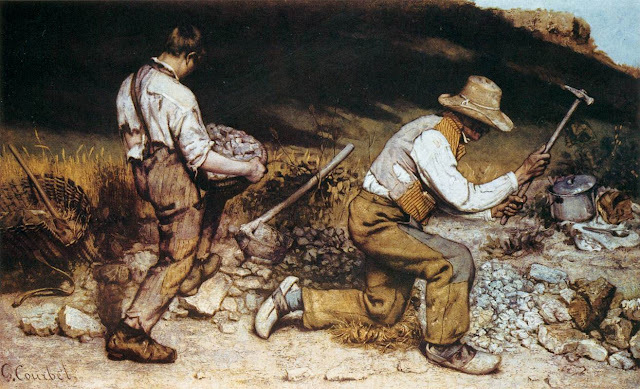 Courbet had seen the two stonebreakers out on the road and then invited them to the studio as models. Probably the pot sat, too, and some heaps of stones were arranged for scrutiny. The old man is carefully if stiffly bent, his left knee cushioned by some yellow grass. And then the nicest touch of balladry, this time with a more subtle humor that just makes you smile: after all the years on his mind-numbing job, the old man still puts such loving care into each single blow. He is about to hit the individual, smallish stone after some more moments of almost Zen-like concentration . . .